Awesome service and excellent customer service from the entire staff I would recommend them to anyone interested in a great pest control company. Linda & Rick, thank you so much for the great review! We are so glad you are happy with our service & look forward to continuing to keep your home pest free. IVE USED THIS COMPANY FOR YEARS. BEST COMPANY EVER. Darline, thank you so much for being such a great customer over the years. We appreciate you! I really enjoy the low pressure family type service atmosphere. I highly recommend Bulls Eye Pest for your home pest services. Thanks for the great review, Danny! We take pride in our customer service & look forward to continuing to take great care of your pest control needs. Very professional staff and excellent results! Thanks Charles! We look forward to continuing to keep your home pest free & providing great service. Bulls-Eye Pest Control has the best natural pest control products. They also have the best customer service by far! Eva, we appreciate your business over the years & look forward to keeping your home pest free in the future. Thanks so much for the review! The technician that arrived was professional and thorough. When my wife and I purchased this home, it was not well maintained, there were webs, spiders, and roaches everywhere! The first quarterly service from Bulls-eye made an immediate impact, and by the second treatment that was done last week, our issues have been eliminated. Great job Bulls-eye! Darren & Denise -- thank you for the review! We are so glad that we made an immediate improvement for you and look forward to continuing to keep your home pest free. We are so happy you are pleased with the service & look forward to keeping your home pest-free. Thanks for the review! We appreciate the 5-star review & look forward to continuing to provide you with great customer service. Thanks! Was very pleased with your services..Thank You. We are so glad you were pleased with the service & look forward to continuing to keep your home pest-free. Thanks for the review! Thanks for the great review! We are so happy that you are pleased with the service & staff and look forward to continuing the great service. Everyone is so polite and very knowledgeable. I have been doing business with them for almost 10 years and they have not let me down! Love the office staff as well...they are always willing to work with us and find a way to help work around our schedule. Great company to work with! Thank you so much for being a long-time customer. We appreciate you & look forward to continuing to keep your home pest-free. We have been having very good experience. Keep up with the good work! We are so happy that you are pleased with our services & look forward to keeping your home pest-free. Thanks for the review! Thanks for the 5-star review! We appreciate you & look forward to continuing to provide you with great customer service. Thanks for the great shout-out to Adam & the review! We are so glad that he is providing you with great service. Adam did a great job; he took his time and was very thorough and answered all of my questions. I was very happy with the pest control service! Thanks for taking the time to give the great review on Adam & the pest control service provided. We appreciate you & look forward to continuing to provide you with great service. Bulls-Eye professionals were able to explain what pest were evident in our home and how they planned to remedy this. Fair and effective. Always professional, on time, and thorough. Would recommend to anyone! Excellent service and very polite! Thanks!! We appreciate that they are reliable and great with explaining any issues and recommending long term solutions. We look forward in continuing to do service with them. The technician called to confirm and then called again that he was going to be a little later. Normally don’t get that courtesy extended. He was professional and handled his work efficiently. Excellent service. Great company!! Love this team. Very thorough job, explained everything he was going to do. Upfront about cost, arrived on time, very polite. Called Bulls-Eye for a wasp problem. Technician (Kyle) came out the next day. Arrived on time (actually was a little early). Very knowledgeable and polite. I have not had any problems since treatment and the price was lower than I was expecting. Will definitely use them again for any kind of bug issues! Great about keeping everyone updated on status of work orders. Very friendly staff. Bulls-Eye is very proficient in taking care of my beg issues and also explain to me the problems as well as how they handle it. I am sure they would be my go to pest and termite control service provider . Have used Bulls-Eye for years and always been pleased with the quality as well as amazing customer service. GREAT company!!! Technician was very thorough and professional. Always a great experience with Bulls-Eye! As a property manager, we use bulls-eye all the time for our clients. They always show up on time and take care of our clients. I recently used them on my personal home and as expected did a top notch job. Brittany and Derek run a great operation. I highly recommend. We email all invoices once orders are reviewed and released. We are still working on orders completed 05/15-05/20. My apologies for the delay. I am the only person in billing and I have been out of the office caring for a sick family member who was in the hospital. Going forward, if you need a copy of any invoice prior to one being emailed please just email or call the office and someone will take care of this ASAP. I will send all current invoices for your account shortly. They can also be viewed on our online system through portal access. I am satisfied w the service and timeliness. It was somewhat difficult connecting over the phone. The service was expensive but I am sure your pricing is fair as it has always been fair. Great service! Always prompt, courteous and thorough. And whenever I need to call I get to talk to a real human being - always a very friendly and knowledgeable person. 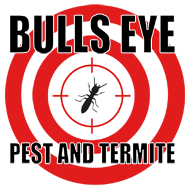 Call Bull’s Eye Pest Control - you’ll be glad you did!